Suppliers of ordered goods are the sales outlets of Maček tvornica vijaka Zagreb d.o.o. Maček Screw Factory Zagreb d.o.o. Through the internet store, it is possible to purchase a complete range of goods that are on offer and in stock of a particular store from which it is delivered to a particular buyer and according to the buyer’s delivery address. The buyer is a physical or legal person who orders or pays the delivery service of a Maček product line from the Factory of Screws Zagreb d.o.o., Radnička cesta 117, Zagreb via the Internet store. Maček Screw Factory Zagreb d.o.o. Reserves the right not to deliver the order if there is any suspicion of misuse. The products are ordered electronically. By pressing the “add to cart” button, the selected product is added to the shopping cart. Products are considered to be ordered at the time when the customer passes the entire order process (checkout procedure). After making and confirming the order, you will receive an e-mail confirmation that the order was received by the Maček tvornica vijaka Zagreb d.o.o. The confirmation is generated automatically by the server and forwarded to the buyer at the time of confirmation of the order. Product pictures on the internet store are illustrative in nature and the image that illustrates the product on the website does not have to match the actual layout and content of the product. Maček Screw Factory Zagreb d.o.o. will attempt to publish accurate and up-to-date information on the Internet Store website, but does not assume responsibility for the accuracy and completeness of the same. Upon confirmation of the order, an order e-mail is issued to the official e-mail address of the Maček Tvornica Screws Zagreb d.o.o. on the basis of which an offer is made with the total price of the ordered products and any other costs (delivery), which is then sent to the buyer as a feedback. After the buyer receives feedback on the suggested offer, he/she must accept, cancel or modify the same offer within the time limit shown on the offer itself. Orders will be arranged in a way that they can’t be damaged by common handling during transportation. The buyer must check the shipment before taking it over, report any visible damage immediately and refuse to receive the damaged shipment. The buyer takes upon himself the obligation to pay the ordered products to Maček Screw Factory Zagreb d.o.o. upon receiving them. The delivery cost (for shipments under 500.00 HRK) is charged in addition to the regular price. The delivery cost for shipments under 500.00 HRK within Croatia is 29,00kn + VAT. All orders are delivered every day by the company Maček Tvornica vijaka Zagreb d.o.o. and its own delivery vehicles or via a courier service. Delivery is possible as soon as the day after the order was placed. In the event of a return of ordered goods, the buyer is obligated to submit a complaint to the company Maček Tvornica vijaka Zagreb d.o.o. by e-mail, telephone or in writing in accordance with legal requirements and deadlines. Delivery of goods which weren’t ordered. Delivery of damaged or defective goods. In accordance with the Consumer Protection Act, you are authorized to terminate the contract unilaterally without stating the reasons for this within 14 days from the date of delivery of the product or the last product ordered. We will respond to your complaint within 15 days. We appreciate your opinion and we invite you to contact us with your inquiries and suggestions. The contract, that the buyer agrees upon with the Maček Screw Factory Zagreb d.o.o. for the sale of goods and services, is a one-time contract on the sale of a product or service that is consumed by delivery of goods or services by the Maček Screw Factory Zagreb d.o.o. and paid by the buyer, if it is not terminated. These terms are an integral part of the terms and conditions of business between the Maček Screw Factory Zagreb d.o.o. and the buyer. In accordance with the Consumer Protection Act, you are authorized to unilaterally terminate the contract without stating a reason, within 14 days from the date of delivery of the product or the last ordered product. or through any other unambiguous statement in which you express your will to terminate the contract on a durable medium. In the event of termination of the contract, each party shall return to the other one what it has received under the contract, in accordance with the regulations of the Consumer Protection Act. We will refund your money after the goods are returned to us. Returns must be made without delay and within 14 days from the day you have provided us with a unilateral termination of the contract. 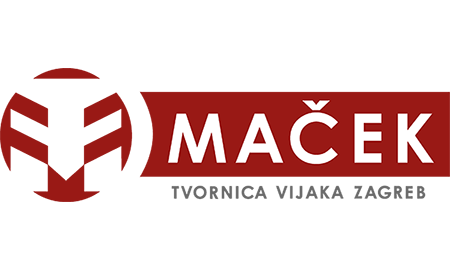 Direct costs of reimbursement of the goods shall be borne by the customer if he/she uses his / her right to unilaterally terminate the contract and if the product can not be returned by mail in the usual way, the buyer can contact the Maček Screw Factory Zagreb d.o.o. (+385) 1 2338 866 or email [email protected] to obtain information on how to return the product. In accordance with the Consumer Protection Act, the buyer is responsible for any impairment of the quality of goods resulting from the handling of the goods, except for what was necessary to establish the nature, characteristics, and functionality of the goods. By accepting these terms, you have also accepted the regulations of said Ordinance. The right to a unilateral termination of the contract is excluded in several cases.